I never had an issue in the past with dark circles or fine lines. Later, moving to a new city, new job, erratic timings and then a brand new chapter in my life, my baby :) everything started showing up signs of fatigue & stress on my under eyes. I developed dark circles and fine lines In the under-eye area. I didn't take them that seriously and used the same moisturizer that I used for my face, on my eye area. 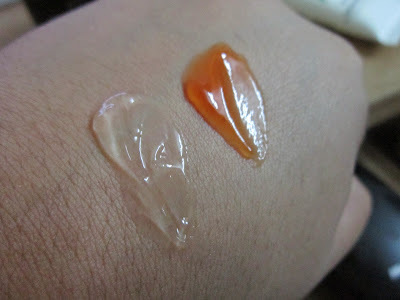 I preferred a gel over any cream based product because of my oily, acne prone skin. 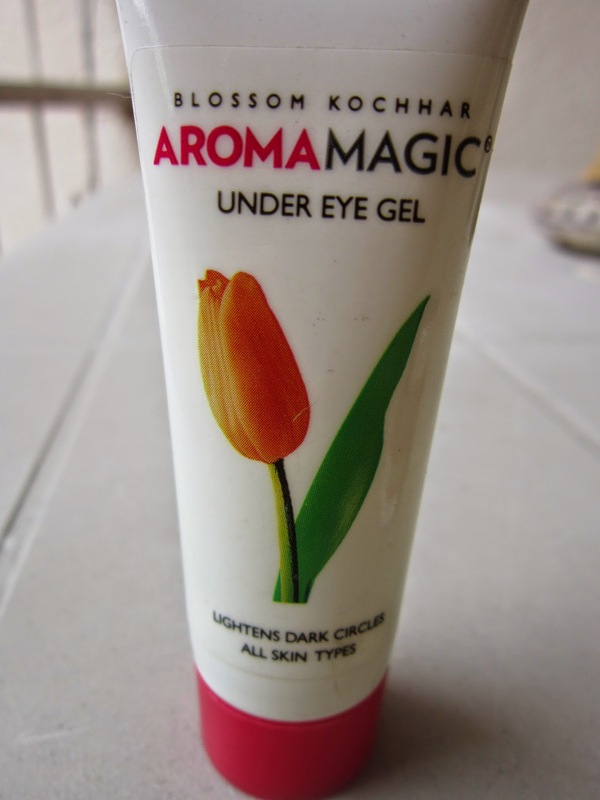 This was my very first under-eye product and I was a little skeptical about it. The colourless gel is absolutely cooling & really soothes the skin. 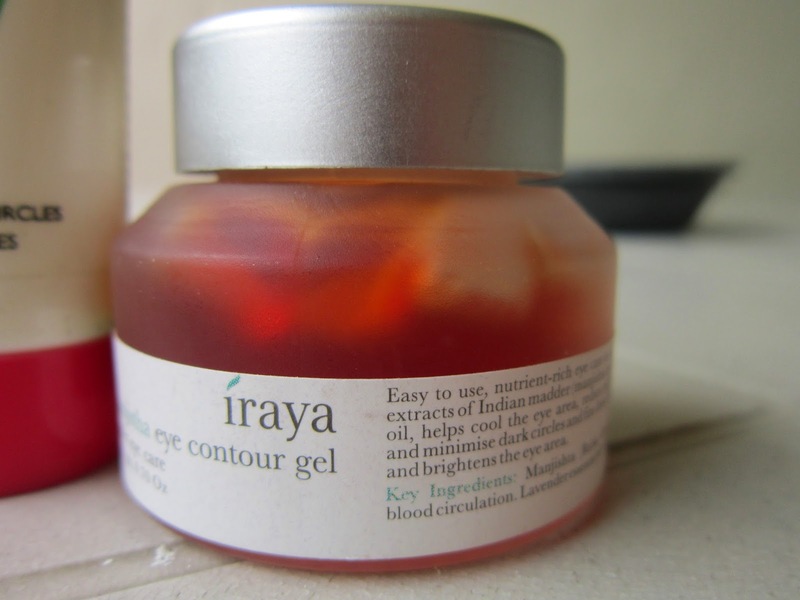 Since it's a gel and makes the under-eye a bit oily before it's completely absorbed, its best used at night, before going to bed. I'm not sure if it works that way for anyone else, but I had better sleep thanks to the soothing, cool gel on my eyes. I sometimes pop the tube into the fridge for about 10 mins before application & gosh! my eyes think they're in a SPA!! It does have the faintest scent to it, but it's never bothered me that much; you might not even get the scent lol I just happened to take a whiff of it, consciously for the sake of the review. 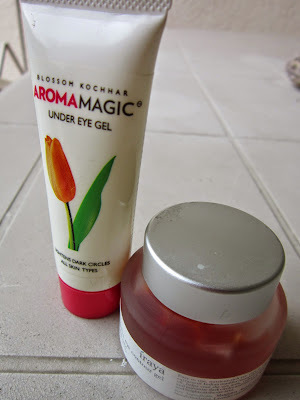 Consistent use of the Aroma Magic Under-eye Gel has definitely helped me reduce fine lines, to a certain extent. I didn't see any significant change in the dark circles though :-) but I'm not writing this off so soon. I love this product even if it does only half of what it claims. It's absolutely travel-friendly and I know I wont skip on it even when I'm away from home. The tube I'm using is almost over now, but I'm sure at Rs.135 I will definitely get this again. 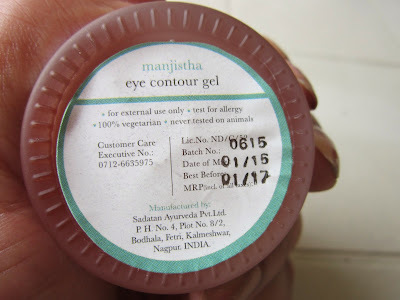 I received this gel as a part of my subscription box & have been absolutely loving it ever since! 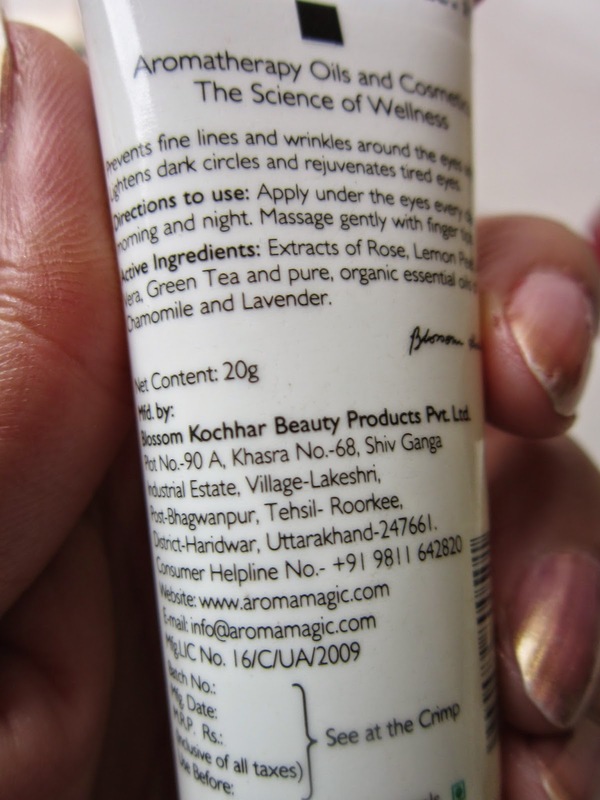 This brownish orange gel contains Ayurvedic ingredients which are known to have health & skin benefits. 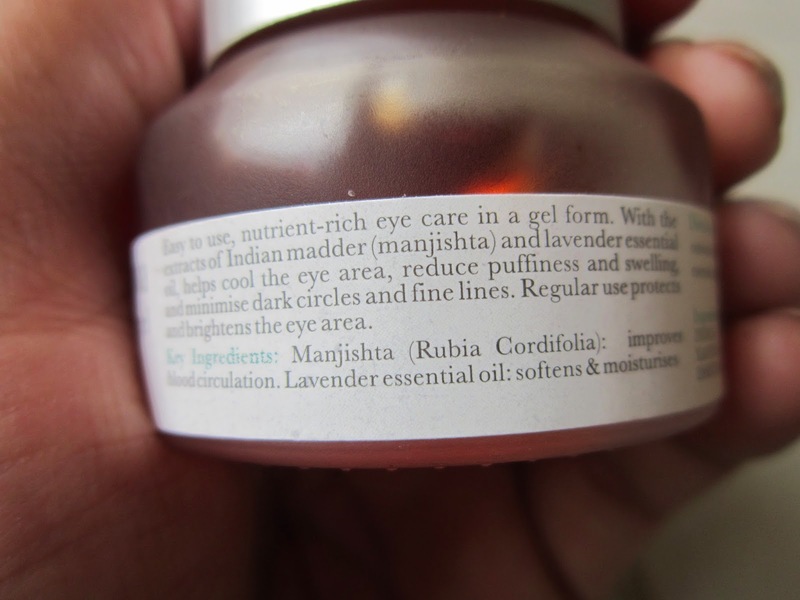 Manjishtha is said to improve blood circulation - no wonder I don't see much puffiness in my eyes in the morning; while Lavender oil softens and moisturizes the skin - aah! another reason why I sleep better...Lavender!!! Overall, I'd say I was lucky enough to find 2 eye products which were easy on the pocket & worked best for me. I alternate between them every two three days now & I must say I'm pretty happy with how they're working for me. Hope this post helped in some little way, if you're in the market for an under-eye product. Let me know in the comments below about your favourite eye creams and I'd love to try them out sometime. Amazing post. I'm very tempted to try the aroma magic eye gel. 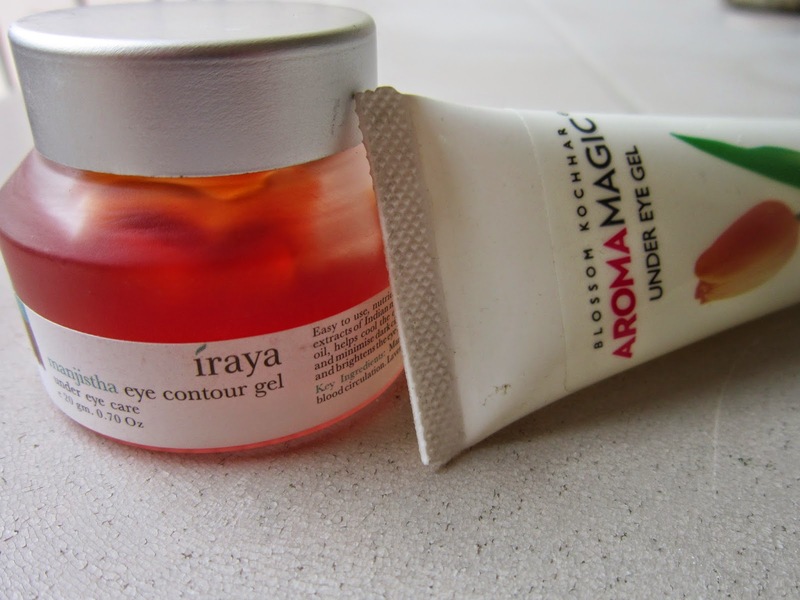 If you like under eye gels you should definitely try the biotique seaweed eye gel. That's my absolute fav.